Bullets fired from a gun will have "striae" (linear grooves) imparted as a consequence of traversing the barrel, and these marks help to identify the weapon. Comparison of bullets involves "class" (caliber and rifling) and "individual" characteristics based upon burrs or imperfections in the barrel, particularly the muzzle, that impart specific markings, or striae, to fired bullets. Individual characteristics are used to try and determine if a specific gun was used in a crime. 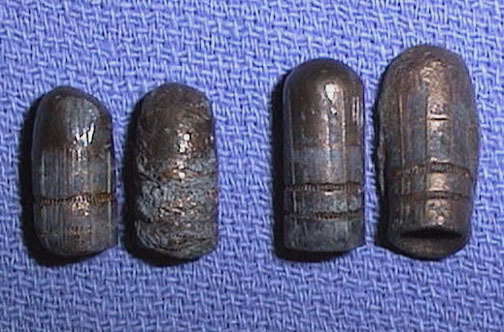 The sets of bullets shown here are from the same class, but deformations in recovered bullets (the right of each pair) can complicate comparison.